These cuttings came to the Mills Archive from many sources. They have been gathered together into one Press Cuttings Collection. 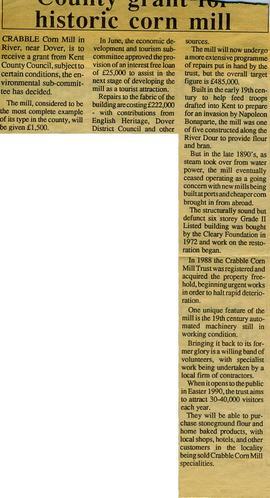 Press cuttings relating to windmills and watermills. CUTT-00001 to CUTT-01776 catalogued by Sarra Sheikh, June-September 2014. CUTT-01777 to CUTT-04570 catalogued by Talbot Green, September 2014 - November 2016. CUTT-04571 to CUTT-04953 catalogued by Alison Owen, July-September 2017.